Home :: Wheel Trims, Wheel Covers :: 14" Wheel Trims :: 14" Black Silver Multi Spoke Car Wheel Trims Covers & Free !!! 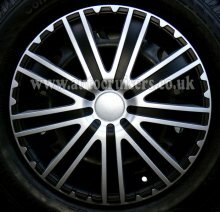 14" Black Silver Multi Spoke Car Wheel Trims Covers & Free !!! 4 Piece set. 14 inch, 4 universal wheel trims in a colourful box. Holes for easier colling of the wheel trim.